After the massive events of the "Best of Both Worlds," and the intimate exploration of the fallout of those events in "Family," Next Gen hits the reset button to give us a standalone episode centering around Data. This was generally a solid episode, with some nice world building and the reveal that Doctor Noonian Soong was alive, at least for a little longer. Data's creator was an interesting guy, clearly a genius but also a bit of an enigma. His love for both Data and Lore was well established, thinking of them both as his actual progeny. It made Lore's anger and feelings of betrayal work, despite the fact that he was evil and deserved what happened to him. Speaking of Lore, I love the subtle ways he was totally different from Data. The question of emotions was an interesting one. Does Lore have emotions? Did he even need the chip, and were his motivations purely selfish, as in depriving his brother of something he already has? Or does Lore just have more complex programming, designed to mimic emotions but without true feeling? Either way him stealing the chip was the kind of act that fits the dynamic he has with Data. Data on the other hand is such a pure soul, both kind and compassionate despite the fact that he has no real 'emotions.' In the past he has grieved for a lost friend (Tasha), and now he has a father that he will probably never see again. It speaks to the ongoing question of whether Data, despite his limitations, is truly alive. That is what makes this episode worthwhile, even though it is mostly just an episode with no changes to the status quo. Lore will be different with the chip, perhaps, but the idea that Data could have been fundamentally changed by this episode is a bitter pill. We got a glimpse at a real character moment, only to have it yanked away by the need to keep things the same. Even Data's actions while under the spell of Dr. Soong's homing signal will have no real consequences. Picard was upset, but the frightening implications of what Data did were not even partially addressed. 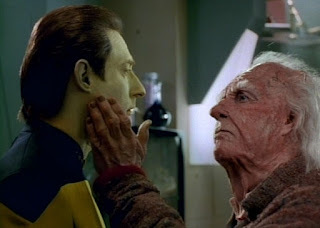 Without any real challenge, Data took over the Enterprise, sealed off all functions of the ship, and locked even Picard out of the computer. Without Data's innate goodness, he could be very dangerous to everyone around him. That kind of realization makes Lore all the more unsettling; he's a perfectly identical version of Data, without his morality to keep him in check. When you step back and think about it, it makes Lore one of the more terrifying villains the show has established. On the other side of the coin, watching the crew try to circumvent Data's escape and then their futile attempts to retake the Enterprise were at least fun. The whole situation with the dying kid did give a countdown-like aspect to the story, but I didn't once believe the child was going to die, so that tension was basically artificial. It did at least give us a few really nice Beverly scenes, and Riker had some fun lines. But overall, the B-Plot was a bit meh. The cascading force fields were a really neat way to show how the ship could be manipulated by someone with the right skills. The security code that Data implemented was so long that even though it was alpha numerical, it was still a 269-bit encryption. With current technology it would be impossible to crack. I bet the Enterprise computer could have done it in time, but since Data locked most of the computer functions, the crew was basically screwed. I'm not entirely sure if it was implied that Soong died at the end of the episode, but he didn't die on screen. Dr. Soong: "I, uh... I never felt too comfortable... living anywhere without a... prearranged route of escape. I admit I, uh, I wouldn't have guessed I'd be running from a giant snowflake." Dr. Soong: "You know what Michelangelo used to say? That the sculptures he made were already there before he started, hidden in the marble. All he needed to do was remove the unneeded bits." Lore: "Often-Wrong's got a broken heart. Can't even tell his boys apart." Lore: "Where's Data? You didn't fill Data with substandard parts, did you, old man? No. That honor was bestowed upon me. You owe me, old man. Not him. Me." Data: "I am not less perfect than Lore." Dr. Soong: "Everybody dies, Data... well, almost everybody." Riker: "The only way we knew we'd come out of warp was by looking out a window." While this episode was decently well written, and Spiner's performances as all three of the major players in the A-Story were a lot of fun, this was not a great episode. 3 out of 4 Emotion Chips. Brent Spiner was wonderful in this. I loved Data's openness, Lore's childish responses, and DR Soong's fatherly bewilderment. The whole episode might not be great, but that scene with Spiner playing every part was mesmerizing. I'll echo what Mallena (and J.D.) said. I'm a fan of Brent Spiner's and he was, as always, wonderful. I noticed this time through that they limited the amount of split screen: it was mostly shots of each character by himself. Which of course makes sense, or filming this episode would have taken a whole lot longer. It did make me wonder how safe it was to have Data around in the first place when he could so easily take over the ship without breaking a robotic sweat. Of course, he's also saved the day so many times now that it more than averages out.